Established in the year 1986, Al- Can Exports Pvt. Ltd. is one of the eminent Manufacturer and Exporter of quality approved gamut of Gas Cylinders, Gas Cylinder Accessories, Oxygen Regulator and Gas Probe. The products provided by us are designed and fabricated using the best quality raw material, obtained from reliable vendors of the industry. This range is highly demanded in the market for its excellent performance, high effectiveness, superb quality and corrosion resistance. We offer these products in several specifications as per the different needs of respected clients. Each Al-Can cylinders go through specified Testing at every stage of production by the highly qualified quality control process and also undergo a series of cyclic Testing to stimulate its Life. The Company manufactures a wide range of Cylinders with highest quality standards for total Customer satisfaction. AL-CAN key competency lies in adhering to committed product quality, strong interface with customers and flexibility to meet customer’s requirement. Under the visionary guidance of our mentor “Jigna P. Madia” (Marketing Incharge), we have been able to place ourselves at the peak of success. His rich industry experience and expertise enables us to gain a commendable position in the domain. Widely reckoned as one of the prominent names in the industry, we have attained the trust and faith of our customers by providing them the qualitative range of our products within the specified period of time. Our offered products are also available in various customized options as per the specific demands of our valuable clients. By providing our customers the finest quality products that are designed in accordance to global quality standards, we have attained huge admiration in all across the market. By providing these products within the assured time frame, we have become the preferable choice of our patrons. Our professionals work in close synchronization with our customers in order to comprehend their precise needs and demands. Our professionals make use of contemporary techniques in the manufacturing process for offering supreme quality products to customers. Owing to our moral business policies, timely delivery, economical prices and customer-centric approach, we have been able to maintain a cordial relationship with our valued customers. 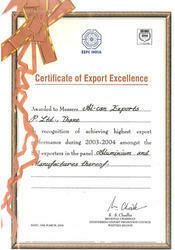 We have receievd certificate for export excellence.